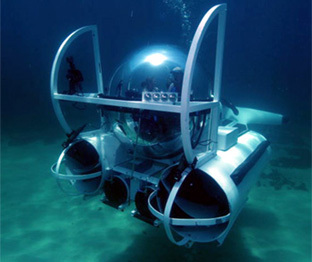 The Ocean Pearl from SEAmagine submarines is intended as a recreational sub to be carried aboard large luxury yachts. The Ocean Pearl features a spherical cabin giving an excellent 360° view for the pilot and passenger. The sub is capable of diving to a depth of 300 ft (91m) and has a range of 12 nautical miles. The Ocean Pearl can perform multiple dives in one day and can be run on the surface, simplifying launch and recovery.